Assange's Lawyers Say His Extradition Could Mean The Death Penalty : The Two-Way As evidence, the WikiLeaks founder's lawyers used published reports in which Sarah Palin called for his execution. WikiLeaks founder Julian Assange addresses the media as his lawyer Mark Stephens looks on. 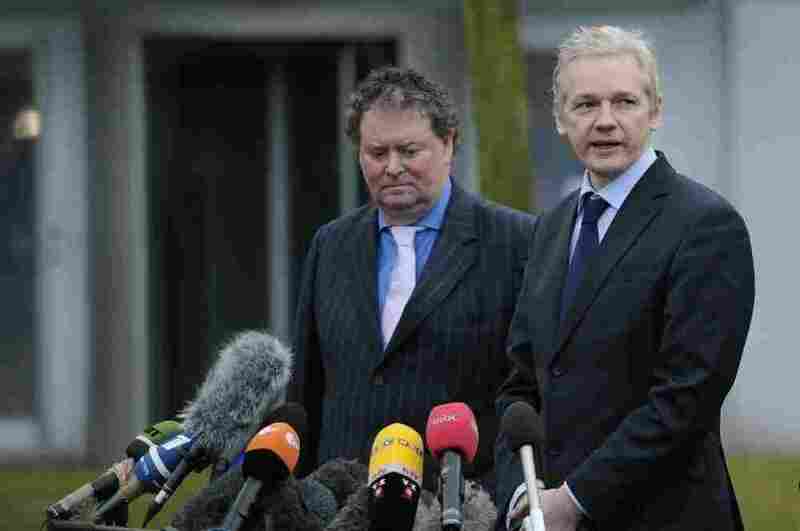 In legal papers released, today, lawyers for Julian Assange argue that if the WikiLeaks founder is extradited from Britain to Sweden, he could eventually be extradited to the U.S. and end up in Guantanamo or facing the death penalty. "There is a real risk he could be made subject to the death penalty," Assange lawyers say in documents they released Tuesday, citing British media reports[link was added by us] that Republican politicians Sarah Palin and Mike Huckabee have called for him to be executed. The lawyers released a preliminary outline of their planned arguments Tuesday, ahead of an extradition hearing for Assange next month. In the legal papers, lawyers argue that under Swedish law "mere suspicion" of a crime is not reason enough for extradition. Authorities are seeking to bring Assange to Sweden in order to question him in connection with allegations of sexual misconduct. The New York Times reports that for the first time, the names of the alleged victims were made public, which could prove a crime under Swedish laws. “Our work with WikiLeaks continues unabated and we are stepping up our publishing for matters relating to Cablegate and other materials,” Mr. Assange said after Tuesday’s 10-minute hearing, using the organization’s term for State Department documents. “Those will shortly be appearing through our newspaper partners throughout the world,” he said, without elaborating on the content of the threatened disclosures. In recent weeks the flow of new documents has slowed to a trickle.